The club’s topper ladder is intended to be a fun competition that anyone and everyone can participate in. It is separate from all other cups and competitions so even if you don’t want to commit to a points series you can still join in the ladder and sail as little or as often as you like. The ladder will created by drawing the names of those interested out of a hat. Those not interested at this time may join the bottom of the ladder whenever the fancy takes them. Once on the ladder you may challenge anyone up to three places above you. They have ten days to agree a match. If they can’t commit you swop places. If you win you swop places. There is no penalty for losing ( and trying) you just both remain in your positions. The ladder was dreamed up to encourage friendly competition and to take the place of the Thursday pursuit racing although you can obviously sail whenever it suits both parties. Please be aware that although this is a fun event normal basic racing rules apply i.e. no collisions. The decision to sail and the safety aspect is the responsibility of the participants. It might be that both participants agree to race in a different boat , lasers for example, although the Topper should be given priority. Please come along to the General meeting on the 24th March at 14:30, both to support the club and to pass comment on this venture. 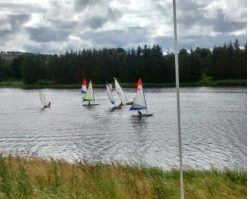 This entry was posted in activity, social and tagged fun, sailing ladder, topper on March 21, 2019 by Erwin Oosterhoorn.